Marlene Smith aboard Mary Main. 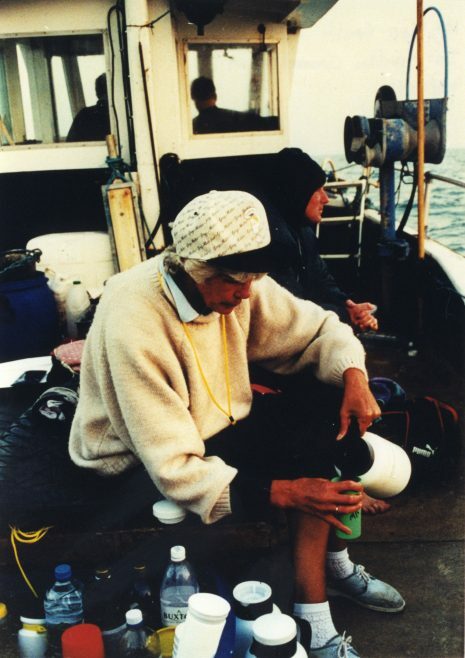 Joe’s wife Marlene aboard the support boat “Mary Mayne” preparing a drink/meal for Joe on his successful channel swimming attempt. Joe Smith swam the English Channel on the 6 September 1999 in a time of 14hrs 19mins, at the age of 65, making him the first British Pensioner to succeed, and also the last person to swim the Channel in the 20th Century. Joe had two unsuccessful attempts in 1961 and 1962, both due to the inclement weather. He won in the BLDSA Windermere Championship in 1959 and 1960 and swam it again in 2000 at age 66. First place in the Morecambe Bay Championship, 1959 and 1960. Won Morecambe Inshore swim 1958, 1959, and 1960. He won the first Lake Bala swim in 1960 and came 6th in 2010. He represented the BLDSA in the 1960 Schelde swim (Holland), placed third. He swam Torbay, Coniston Vets, Pickmere, Lake and many others. He was an Olympic Torchbearer in the 2012 relay. He was inaugurated into the International Swimming Hall of Fame in Fort Lauderdale, in the U.S.A.
We go nowhere without the support of our Family and Friends and Marly was a great supporter of Joe telling him to forget about documenting the costs and to focus on getting it done – So, he got it done with both Marly’s mental support and practical support during the swim.